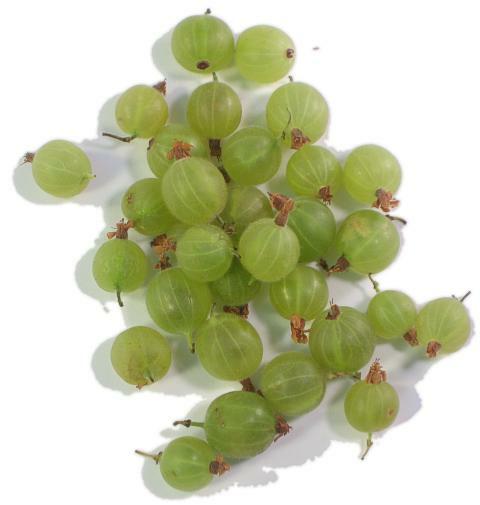 General Information: The gooseberry is a small round fruit that comes in hundreds of varieties. Most plant experts suggest the earliest cultivars of gooseberry plants were in Northern Africa. However, the gooseberry is now grown widely throughout Northern Europe and in North America. The gooseberry bush stands about 3-5 feet (.91-1.52m) high. The bush has spines, making gooseberry picking a little harsh on the hands. In North America, the gooseberry's season extends from May to August. One finds them most frequently in June, but this depends on temperature and location. Gooseberries also seem to withstand harsher temperatures. The makes them easy to grow in areas with frosts and snow. The fruit itself is usually comparable in size to blueberries. Gooseberries can be round, oblong or teardrop shaped depending upon their variety. They also come in a delightful color range, from green to red to purple. The interior flesh of the berry will match the color of the skin, but has a slightly translucent appearance. Most liken the unripe gooseberry in taste to a sour grape. The ripened gooseberry is harder to find, but is often compared to the Muscat grape in flavor. Since it is difficult to obtain riper gooseberries, the fruit is often used with sugar in dessert recipes. The gooseberry definitely responds well to baking and sugaring. Gooseberry tarts and pies are common. Similarly gooseberries may be added to the many baked puddings in place of raisins or currants. They also can be stewed, or used in crunches or cobblers. If one can obtain ripe gooseberries, many prefer simply eating them raw, or adding them to fruit salads. They also provide interesting texture and taste in green salads. The term playing gooseberry is used in an idiomatic expression unique to the British and the Canadians. To play a gooseberry is very much like being referred to as "the third wheel". The gooseberry may accompany a romantically linked couple on a date. It is hard to determine if the expression derives from the fact that the single person may blush from the romantic doings of the couple, thus resembling a gooseberry. Alternately, perhaps the single person is too "thorny" in nature to procure his or her own date.